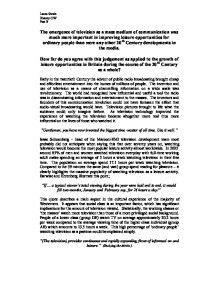 The emergence of television as a mass medium of communication was much more important in improving leisure opportunities for ordinary people than were any other 20th Century developments in the media - Discuss. The emergence of television as a mass medium of communication was much more important in improving leisure opportunities for ordinary people than were any other 20th Century developments in the media. How far do you agree with this judgement as applied to the growth of leisure opportunities in Britain during the course of the 20th Century as a whole? Early in the twentieth Century the advent of public radio broadcasting brought cheap and effortless entertainment into the homes of millions of people. 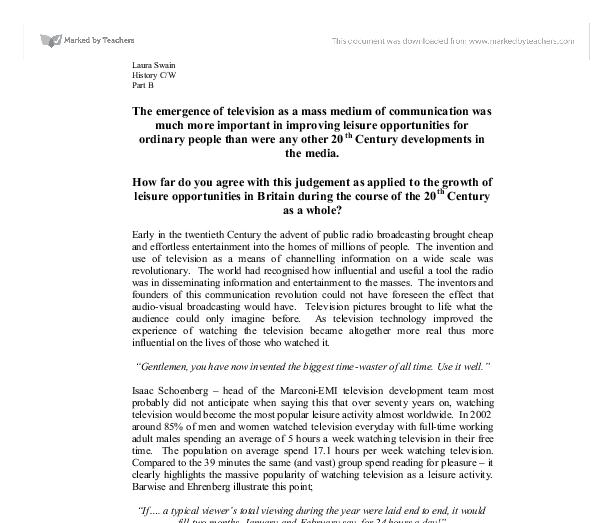 The invention and use of television as a means of channelling information on a wide scale was revolutionary. The world had recognised how influential and useful a tool the radio was in disseminating information and entertainment to the masses. The inventors and founders of this communication revolution could not have foreseen the effect that audio-visual broadcasting would have. Television pictures brought to life what the audience could only imagine before. As television technology improved the experience of watching the television became altogether more real thus more influential on the lives of those who watched it. "Gentlemen, you have now invented the biggest time-waster of all time. Use it well." Isaac Schoenberg - head of the Marconi-EMI television development team most probably did not anticipate when saying this that over seventy years on, watching television would become the most popular leisure activity almost worldwide. ...read more. In Bhutan, television was introduced suddenly to a society, which had no previous experience of television and was over seventy years behind the rest of the world in terms of media and communication. As a result the impact was extreme. In Britain and America television and broadcasting was introduced and expanded slowly, gradually creeping into the lives of the population. It has been debated upon whether or not John F Kennedy would have beat Nixon to the office of President his aesthetically pleasing appearance not been televised (hence the phrase 'style over substance'). It was clear to most that Nixon had the better policies and arguments. The power, influence and all-pervasive nature of the media itself could be responsible for the reduction in non-media based (or out of home) leisure activities. Positivists would have it that the media or television shapes society and its attitudes whereas Interpretivists believe society has moulded what we see in the media today. It is likely that this process is less rigid than either of these two theories and more negotiable between media producers and the consumers. Negative attitudes or a general bad political or social atmosphere will be reflected in the media. Newspapers and television producers represent selected and edited images and speech in their reporting of crime. The media have created a series of moral panics over the last century, all of which can only be described as witch hunts. ...read more. Aspects of culture which were previously unattainable or inaccessible to the 'ordinary person' have been made available. In this respect, television has almost certainly improved the leisure opportunities of the ordinary person. As for the emergence of television improving leisure opportunities over the last century, it would appear that this is not the case. Television has (along with the internet etc) marginalized every other form of pastime. Superficially appearing to offer everything the consumer could want or need to have fun. Culture has been altered over the past 100 years in such a way that it is now the acme of deviance not to own or regularly watch television. It is possible that most people watch television, not solely for pleasure, but to 'keep up' with everyone else. In this media saturated society - conformity seems vital. Television has most definitely changed the nature and scope of leisure opportunities for all people - but simply by narrowing the minds of most to believe that watching television and buying into what it has to offer is the answer to all life's problems. To access whether or not television has improved leisure opportunities, the word 'improving' must first be defined. If 'improve' is taken to mean widen and improve choice and quality of entertainment and leisure then it almost certainly has failed. This of course is subjective opinion; doubtless the millions of 'happy' consumers would disagree. 2371 Words Laura Swain History C/W Part B ...read more. The photographs were later proved to be forgeries. Piers Morgan was fired and walked out of the Mirror Offices. The pluralist theory that newspaper owners do not control the output of their media, some editors control the output themselves. Another example of disputes between organisations is the Government versus the BBC over the Iraqi war. where the camera lingers just a little to long over a logo before shifting back to the main action." Where and when an advertisement is shown is believed to be significant when trying to promote a product. Documentaries on TV and features in magazines of a harrowing nature (e.g. This shows that he has changed his view on how he should act and uphold his authority and responsibilities as a police officer. Many close-ups are used of the character's faces to show deep emotion and to show how they recognise each other from before. In 1965 there were 192 million media receivers of TV, by 1992 it had risen to 873 million users globally. (7) Television is a potent force in the globalising process its visual essence means it passes language barriers. Also due to a large amount of illiteracy in the third world it can be a extensive communication medium (6). Anderson and Dill5 suggested that media violence (and violent video games) were 'probably' a factor in the massacre at Columbine High School in America. Yet they have been widely criticised by other academics in the field, not least for offering merely second hand undocumented hearsay as grounds for their assertions. By 1875 Britain, France, Japan and Australia had been connected via transatlantic cables, using electric currents, thus making the countries of the world an operating integrated network. The technical aspects of the television involve the scanning of an image via beams of light in a series of lines. Moral Panics historicise youth cultures, which makes people always remember them. The mods were not even a proper youth culture, there is no origin for them, and they just got labelled. Stan Cohen describes the terms moral, as things that happen within society, and panic, as something that becomes a large concern.